Data clearly show natural gas has done more to reduce U.S. greenhouse gas emissions than any other government scheme or agreement. But that didn’t keep President Obama’s senior advisor on energy and climate policy from claiming on Tuesday that government policies deserve much of the credit. As Morning Consult reported, Obama senior advisor Brian Deese argued at an event organized by Columbia University’s Center on Global Energy Policy that tax credits for wind and solar power and investments in clean energy research should largely be credited for U.S. greenhouse emissions dropping to their lowest levels in more than two decades. Though Deese did give some credit to the increased natural gas use that has been made possible by the shale boom, he indicated the government will have to take the lead from here on out for the trend to be sustainable. As the following EID graphic illustrates, CO2 emissions have plummeted at the same time the economy has grown significantly. This simply would not have happened without an abundant supply of clean burning natural gas, which has not only led to a manufacturing boom and an economic turnaround from the depths of the Great Recession, it is also fueling electrical generation at an unprecedented clip. As result of abundant and clean-burning natural gas, the U.S. Energy Information Administration reports that between 2006 and 2014, natural gas has prevented 1.25 billion metric tons of carbon dioxide from being emitted from power plants in the United States. By comparison, the use of renewable energy has prevented 789 million metric tons of carbon dioxide, according to the EIA. Notably, the above reductions attributable to renewables have been facilitated by natural gas. A recent report that noted that renewables like wind and solar absolutely must have natural gas as a backup to be a viable energy option. The Breakthrough Institute (BTI) — an environmental group founded by individuals whom Time Magazine recognized as “heroes of the environment” — has similarly found that natural gas has prevented 17 times more carbon dioxide emissions than wind, solar, and geothermal combined. And a recent report by the Manhattan Institute shows that for every ton of CO2 emission reductions attributable to solar power, 13 tons can be attributed to natural gas. 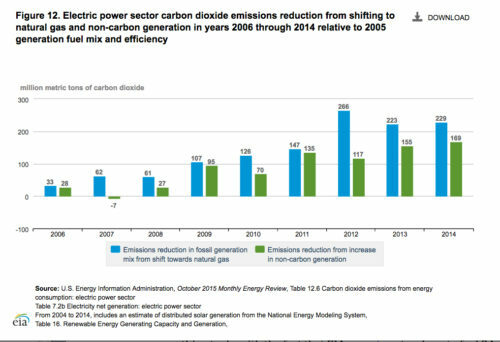 EIA is also projecting 2016 U.S. CO2 emissions to drop to 5.18 billion metric tons, down better than 1.5 percent from 2015 levels. Energy-related CO2 emissions were 2,530 million metric tons in the first six months of this year, the lowest levels since 1991. This could have something to do with the fact that EIA expects natural gas to fuel 34 percent of electricity generation compared with 30 percent for coal. The fact that emissions are continuing to significantly drop from 2015 levels this year is notable considering CO2 emissions fell two percent in 2015. The latter trend prompted the International Energy Agency to state for the record what is becoming more and more obvious. 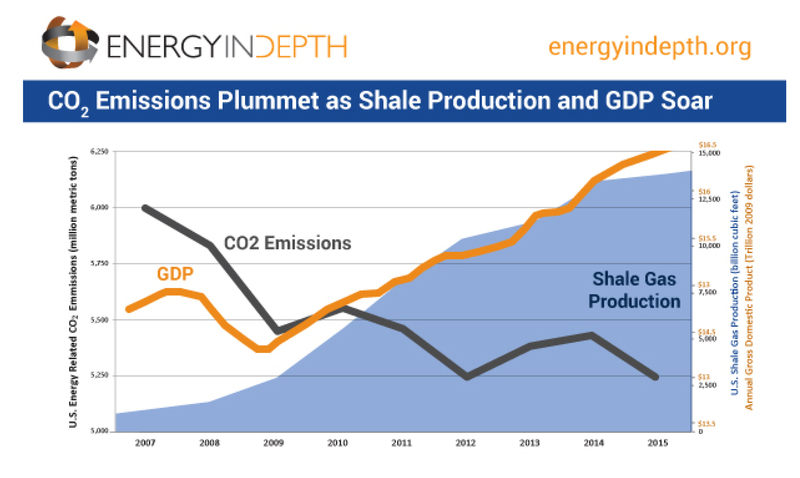 It is abundantly clear to just about everyone that the shale revolution deserves credit for an unprecedented coupling of economic growth and declining GHG emissions.